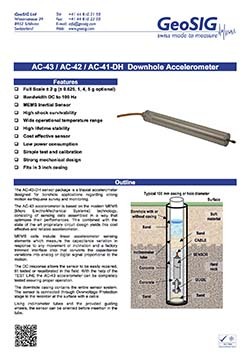 The AC-4x-DH sensor package is a triaxial accelerometer designed for borehole applications regarding strong motion earthquake survey and monitoring. The AC-4x accelerometer is based on the modern MEMS (Micro Electro-Mechanical Systems) technology, consisting of sensing cells assembled in a way that optimizes their performances. This combined with the state of the art proprietary circuit design yields this cost effective and reliable accelerometer. MEMS cells include linear accelerometer sensing elements which measure the capacitance variation in response to any movement or inclination and a factory trimmed interface chip that converts the capacitance variations into analog or digital signal proportional to the motion. The DC response allows the sensor to be easily repaired, tilt tested or recalibrated in the field. With the help of the TEST LINE the AC-4x accelerometer can be completely tested assuring proper operation. 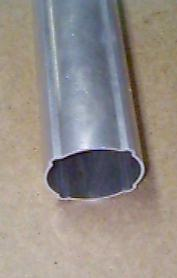 The downhole casing contains the entire sensor system. The sensor is connected through Overvoltage Protection stage to the recorder at the surface with a cable. Using inclinometer tubes and the provided guiding wheels, the sensor can be oriented before insertion in the tube. Metallic, Shielded, IP67, 12 pins, male. optional MIL, Bendix PT07A 14-19P. 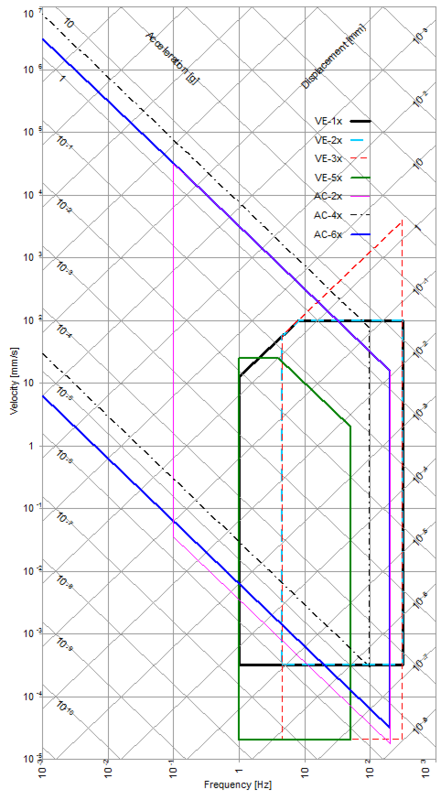 Using 3” inclinometer casing (Figure 1) with included guidewheels (Figure 2). 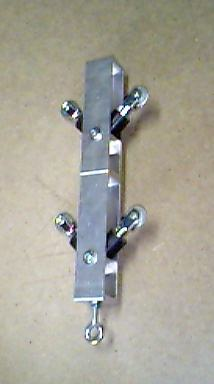 3” inclinometer casing as in figure 1 in sections of 3 meters with coupling elements. All required tools and fixation consumables for up to 100 meters of casing. 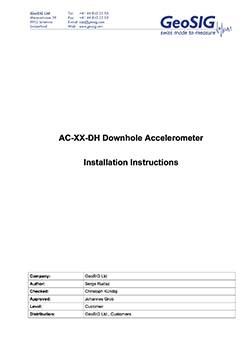 Type of AC-4x-DH, acceleration full scale, depth of borehole and total cable length.